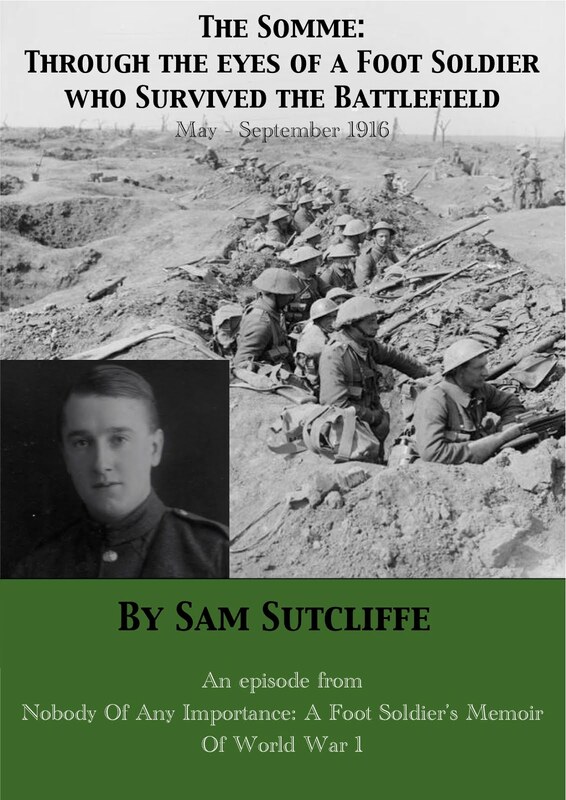 Sam’s first day of battle… and the Battalion’s first deaths, young Nibs, old Ewart Walker – as the panicky RSM threatens to shoot his own men! A hundred years ago… from September 26-28 the Battle Of Loos reached a terrible crescendo wherein 12 British Army Battalions – 10,000 men – suffered 8,000 casualties while, in sum, making little headway. In the same sequence of Allied attacks, on October 3 the German Army recaptured their key stronghold, the Hohenzollern Redoubt near Auchy-des-Mines, and the French commander-in-chief Joseph Joffre abandoned an attempted breakthrough in Champagne (total casualties, for September 25-November 4 as I understand it, French 145,000, German 72,500). On the Eastern Front, through the week, battles continued around Eckau, Dvinsk (both now in Latvia), Lutsk (Ukraine) and the Pripet region (Ukraine/Belarus) with the Russian Army now holding its ground against the Germans for a while, after a long period of steady retreat. And in Mesopotamia (now Iraq), the Indian Expeditionary Force attacked the Ottoman Army at Es Sinn on the Tigris, near Kut-al-Amarah, and drove them eastwards (September 28, Indian casualties 1,233, Ottoman 5,300 including prisoners taken). Last week’s excerpt left Sam (“in a full tizzy of excitement”) and his comrades sheltering behind a ridge of sand or packed earth. 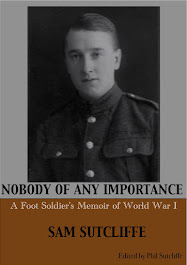 My father had just shown unusual boldness by complaining loudly that, the Battalion having been left almost 24 hours without a meal – “someone had blundered,” he reckoned – he was starving. Other voices chorused agreement and so, within an hour of their four-month participation in the campaign beginning, they consumed their emergency “iron rations”, cooked in their mess tins on the methylated stoves they carried in their packs. ‘Soon we arose, advanced over the ridge, and moved on across fairly level country, rather barren, though supporting the occasional clump of trees. We stopped several times, lying prone on the ground, as ordered, while quiet discussions just ahead of me took place. Too dark to see much, but a fair number of bullets whizzed our way. Sometimes they struck the earth nearby with a ffft; once one hit the trunk of a tree near me with a surprisingly loud crack. We hugged the ground, of course, to let the bullets pass harmlessly above us, but one of those wretched things broke that rule. When one move forward started, young Nibs, more of a boy even than I was, didn’t get up. The Captain was told, all paused again, and the shocking news came along that he was dead, shot through the head. Had he been standing up, that bullet would presumably have damaged a foot or ankle. Stretcher-bearers carried him to the beach. Our first casualty, I thought, young Nibs, the cheerful Cockney; a victim of random firing, not an aimed shot… Later, though, I learned that Nibs was not, after all, the first member of the Battalion killed; old Ewart Walker*, the erudite ex-journalist, had died within moments of reaching the beach — a time-fused shell exploded above his head, relieving him of any requirement to further tax his ageing body, and depriving us of a very good comrade. Heads down now, shoulders bent, we advanced as though we thought this posture offered some protection. I wondered how soon we would reach the position from which our attack would be launched and felt horribly shocked when an order was given to spread out and, in pairs, start digging holes to give us cover from enemy fire. We had to do this before dawn came with only our small trenching tools to help us. We slogged away at it, took turns trying to make a hole just long enough for we two to crouch in. As we penetrated a few inches we could hear the sides shedding bits and pieces… By dawn our hard, non-stop work had excavated a shallow trench about four feet long, two feet wide and two deep, providing very little cover for two now exhausted, shaky, and rather scared youngsters. We rested in the half-light, tired and hungry… Surveying the scene around me, I had doubts about our fitness, at that moment, to advance and capture the heights which loomed above. Facing the hills which, apparently, would be our objective, I saw that someone appeared to have selected a base for our Battalion’s attack which was completely exposed to enemy observation and fire. The terrain to our left and half-left rose gradually at first, thereafter steeply. Before us, ridges and several lowish hills. Beyond those, steadily rising country ascending at some distance from us to a considerable height — black hills of daunting aspect, enough to make me despair of reaching their peaks, even without an enemy’s presence. ‘That first morning we had cause to bless Lieutenant Booth**, the enthusiastic young officer who had replaced Quartermaster wax whiskers***. He did his job of feeding and clothing us with complete dedication and, during the hours of darkness, had applied his energy to bringing forward from the beach some of the stores unloaded from the lighters. A certain sense of security, because enemy artillery had not yet fired on our “advanced” position, encouraged volunteers to distribute food. They gave each of us four rashers of bacon and half a loaf of bread, small paper bags of tea and sugar, and a tin of condensed milk. Some men either had no heaters or found them unsatisfactory so, regardless of their own safety or ours, they lit small fires in the open beside their holes. Our luck gave out at that point. The Turks had either not been looking our way or else observing us with disbelief that we could be so foolhardy, but the smoke offered a perfect target for their range-finders. Shrapnel shells shrieked our way, burst at a height of 20 to 30 feet and sprayed the area. Howls of pain, calls for help, and the disappearance into their holes of the thoughtless fools who had brought the rain of hurtling metal down on us, all occupied but a few seconds. We had wounded and possibly dead men to care for, but we required a few minutes at least to allow the shock of this unexpected attack to subside. I had not seen much of this gentleman previously, but for a while, in Malta, he had enjoyed immense popularity with the rank and file. He was a Sergeant of Marines, lent to our Battalion to raise the standard of our training, particularly with regard to physical fitness. An exponent of a new style of physical training and drill involving non-stop movement, he would issue rapid, staccato commands which had the trainees bending, stretching, turning this way and that, marching, running, flinging their arms about, doing knees-ups (as in Mother Brown), and obeying his exhortations to raise them ever higher. At the time, we all felt he was the man to make real soldiers out of us amateurs, God’s gift to a mob of willing, but unskilled volunteers. So we sweated our guts out in high Mediterranean temperatures, unbelievably anxious to merit the approval of this military Messiah. Even the fact that, during training, he dressed so differently to anyone else, enhanced his attractiveness. He wore Navy-blue slacks and a white sweater at the start of a session; as he warmed up, off came the sweater, revealing a smart, white singlet to match his white, canvas shoes — whereas we wore grey shirts and khaki trousers and heavy boots. Shortly before we left Malta he surprised us all by appearing in a uniform remarkably like that worn by commissioned officers – an arrow on each arm just above the cuff – and there he was, our new RSM, no less. Why was it we felt there was something wrong with his appointment? Now, in addition to this artillery attack, we faced the threat of bullets from our own RSM’s pistol… Realisation of the awful position in which someone’s error had placed us, had a bad effect on morale. And the RSM’s queer behaviour deepened the gloom… he failed us on our first night in the front line. * See Blog 18, 9/11/14for more about the old journalist, Ewart Walker. ** See Blog 51, 28/6/15: “Booth” is my father’s alias for Harry Nathan (1889-1963), promoted to Battalion commander later in the campaign – and much later, as Lord Nathan, a Minister in Attlee’s post-WW2 Government. 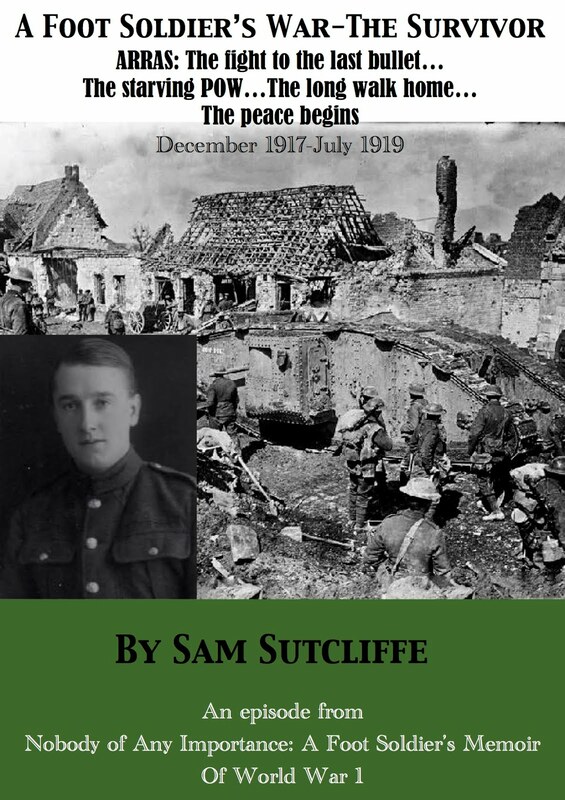 *** A hated figure since the day Sam and his pals enlisted in Bloomsbury, London, September, 1914. Next week: Digging in – and, within days, Sam has a sense that the Battalion’s presence is a “sad, military waste”. Meanwhile, Lieutenant Chalk takes a hip bath on the battlefield… and Sam sings the praises of some unlikely heroes: the front-line sanitary men. 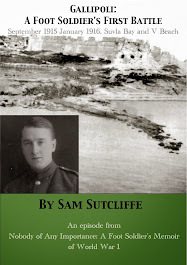 Sam’s first battlefield, Gallipoli – “guns being fired with intent to kill”, shrieking shells, the urgent call for “Stretcher-bearers!”… and he wants his breakfast! A hundred years ago… this week, the Battle Of Loos (September 25-October 14) in northern France began with a British onslaught following four days of artillery bombardment. It was co-ordinated with French attacks in Champagne-Ardenne which had rather more success, though the whole effort failed to “restore a war of movement”, as preferred by some of the generals. Notably, at Loos the British Army used poison gas (chlorine) for the first time. In these early days of what became known overall as the Third Battle Of Artois, casualties began their rise towards eventual official totals of 48,230 French, 61,713 British and 51,100 German. Elsewhere, Russia had an unusual week of success driving the Germans back around Pinsk and Lutsk (now Belarus) and the Austrians in Rovno (now Ukraine). And in the region around Gallipoli, Bulgaria struck a somewhat ambiguous “armed neutrality” agreement with Turkey (September 25) and Greece began mobilising on the Allied side (23) as the Turkish Army in Syria made preparations to attack Egypt. Last week, Sam encountered anticipatory fear for the first time, admitting he was “scared windy”. But he got a grip on it, settling into what he thought of as “the perpetual awareness of danger, which wild creatures display at all times”. Thus, he believed, he might present a “normal” appearance to his comrades no matter what. So, when administrative officers removed his brother from the troopship on the docks at Alexandria (September 17, by one account, but possibly a few days later), at first he felt bereft… then glad that Ted might be spared and “remain in Egypt for the duration of the war”. When they’d left the harbour he checked his massive load of equipment – it weighed around 90 pounds, he reckoned, with all the signalling gear – noting, with his poor boy’s attention to eating possibilities, “a can containing a block of solidified methylated spirit which could be made into a burner, and “iron rations” comprising a bag of small, hard biscuits, single packets of beef cubes, tea and sugar, and a can of Maconochie’s stewed beef – this last, one of that war’s great successes. To broach these rations without the permission of an officer was a serious crime; they were to be used in grave extremity only”. In the same prudent spirit, he writes that when meals aboard concluded, “What bread I, and others around me, couldn’t eat, I stored in any space in haversack or pack. Stew couldn’t be so readily saved… But I picked out leftover pieces of meat, dried them off, wrapped them up tightly in an oilskin cap cover… – scheming about any steps I could take to improve my survival prospects”. After a couple of days, they entered “a perfect natural harbour”, Mudros, on the Greek island Lemnos, the Allies’ Navy base for the Gallipoli campaign. There my father and another Signaller, following orders, spent this hiatus at anchor offering rather unwelcome “help” to the ship’s officer of the watch. Much too soon for my liking, we were ploughing through a choppy sea. One minute it seemed safe and quiet in harbour, the next out here in a small ship on a grey, cheerless day, bound for God knows what. Tired out, I slipped out of my heavy equipment and, with pack for a pillow, soon stretched out on the deck and forgot fears and fancies in deep sleep. [Then when] a wave lapped over the side, splashed around me and made me jump… I found a more sheltered place near the stern where I joined a chap leaning on the rail there. It was too dark for me to identify him. General chat became more detailed after a while, when I remarked that I’d be happier, perhaps, if somebody had told me what we were up to. That this small ship’s course ran surprisingly close to the shore was revealed only too clearly when a burst of rifle fire had me scurrying to the sea side of the ship. I believed I could see, darker than the general darkness, the top of a cliff mass. Yes, and the sounds of desultory rifle fire came from up there. No bullets zinged past, though, so we were not the target. Word passed around for all to be ready to disembark and I donned my load, message case, field transmitter, rifle and all… Whether excitement or fear brought it on I don’t know, but I suddenly felt terribly hungry. Then I recalled that I had not eaten since early morning. Nor, as far as I know, had any of our men. Someone had blundered. Or was it usual to land troops on a battlefield with empty bellies? Our small ship carried G and H Companies, and each assembled without fuss on its appointed side of the boat. Where the dark cliff had towered above us, I now saw the lighter colour of the sky. Across a wider stretch of water than earlier, on land rifles fired continuously and artillery lit up the blackness, each flash followed by a bang, a shriek or a strange whine which often increased in volume then ended up in a big explosion. Guns were being fired with intent to kill and here was my first experience of warfare. I heard the engine of another vessel chugging nearby for several minutes until it bumped against our ship’s side, a lighter of some sort… a voice from the lighter quietly instructed us to “Move across carefully when your turn comes. Watch the rise and fall, then step across.” I soon found myself at the edge trying earnestly to estimate the right moment… I forced myself across the slight gap and the weight of my body and all my equipment carried me forward. It was difficult to avoid crashing into men ahead of me, but this I managed somehow and then braced myself to steady the next oncoming bloke. A howl became a shriek, then a shattering explosion – and a short silence was followed by numerous thuds as what had gone up came down on the nearby beach. While still at sea I heard for the first time that sad, though urgent call, “Stretcher-bearers!” A tightening of the gut and clamping together of the jaws accompanied an inner alarm which then and many times afterwards seemed to produce an acid-like smell on hands and other parts of the body. The lighter moved in closer and our Sergeant Major’s voice came clear above all other sounds, “Take your turn! Go quickly down the ramp, then form two ranks and follow your leader!” As we faced the shore it seemed that rifle fire came mainly from half-left and a fair distance away. But from a wider range of positions came artillery fire. With some relief I formed the opinion that the troops who made the first landing had done a good job in clearing the Turks from the beach, but I soon discovered that the occasional sniper had stayed behind to harass and scare by the uncertainty he created. As I took my turn down the ramp, I heard a quiet chat going on between our Company officer and someone ashore. Without pause, in pairs, we followed our leader on to the beach – the while he continued his conversation with the stranger. We moved uphill for a while, veered right just before reaching the top of a ridge, and shuffled along on this fairly steep slope, left leg bent, t’other extended, an awkward progress, overloaded as I was. When our leader stopped and squatted, we all did likewise along the line. “Stay well below the ridge top and await orders,” was the next instruction passed along. I was in a full tizzy of excitement having been primed by my confiding officer on the ship to expect immediate and violent action. However, when we stayed there for some while, pangs of hunger became pressing – we had not eaten since early morning. In a fairly loud voice, which I hoped would reach our officer’s ears, I said I was starving. “Quiet!” came a reproof, but muttering spread along the line, confirming that others also felt empty. A word of mouth message passed from man to man brought a junior officer over and he explained that no rations had been issued since we left the island harbour. Rightly or wrongly, he agreed that we should start on our iron rations. * According to the biography of their (soon to be) commanding officer Harry Nathan, my father’s Battalion landed at Suvla Bay, Gallipoli, on September 25, 1915 – a Saturday that week – joining the 88th Brigade of the 29th Division.